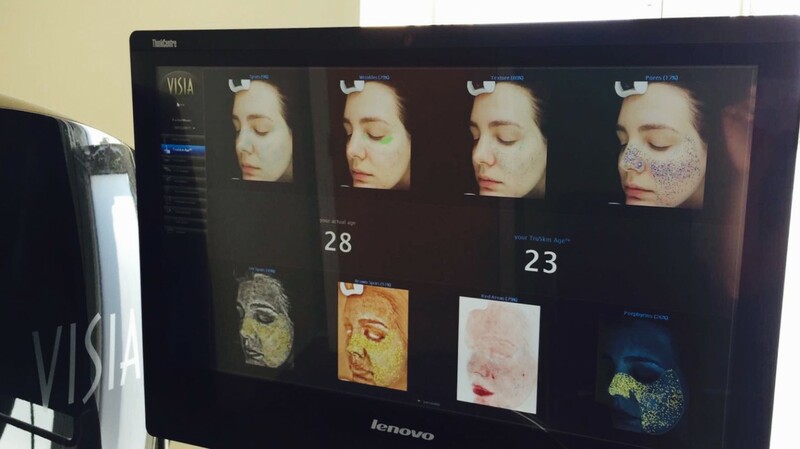 If like me you’re on the quest for a more flawless skin then you’re gonna want to keep reading. There are things I would like to change but I’m also all about preventing. I am dreading getting wrinkles, sun spots and all the other unwanted things that come with getting old. 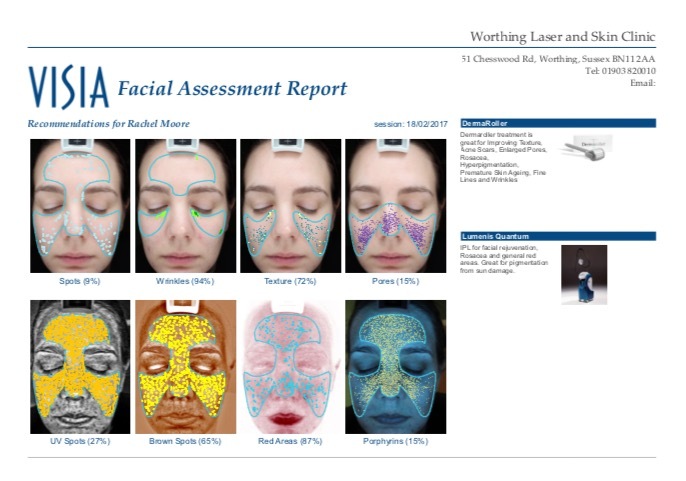 So I headed to the beautiful new Worthing Laser and Skin Clinic to have a VISIA skin and complexion analysis. 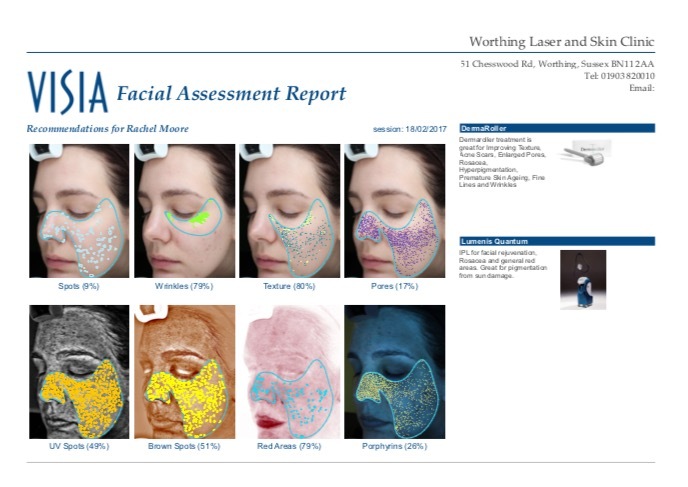 Why because it uses Uv photography and multi-spectral imaging to reveal damage and signs of ageing on and under the surface that aren’t visible to the human eye. Brilliant! 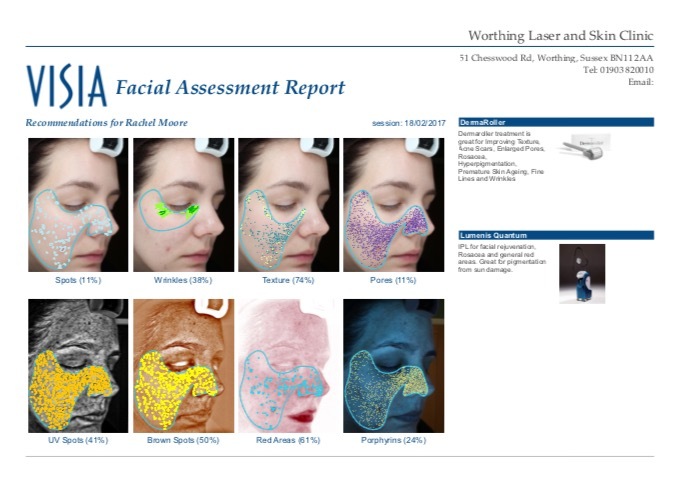 You can detect and tackle some of your skin and ageing symptoms before they become apparent. So you can see exactly what I’m going on about and what you can expect to find out, here’s a look at my skin. Be prepared to see some very attractive pictures. The face support is adjustable to capture both sides of your face and face on so no angles are missed. Lets just say its good the good the bad and the ugly angles. It looks worse than it is. 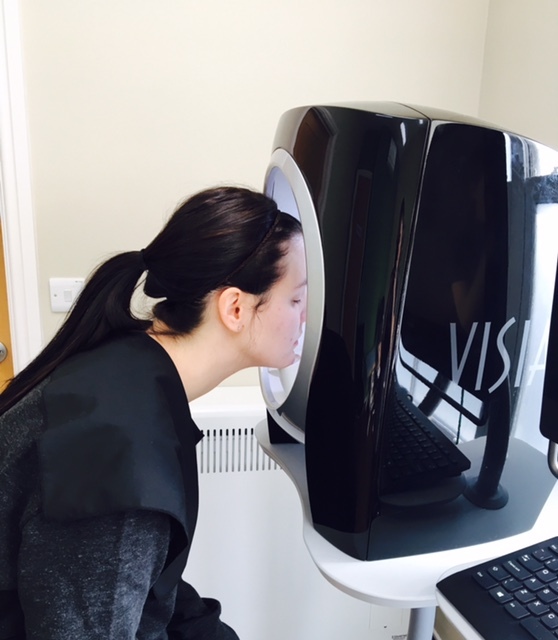 Your aesthetics practitioner will talk you through exactly what you see and treatments tailored to you. I nearly died when I saw the amount of UV spots. Chloe explained I had a reasonable percentage so it’s not as bad as I think. The percentages are based on your skin against other peoples skin in your age range. So my skin is 41% above everyones skin in my age range. Chloe has so much knowledge and made me feel reassured about my results. We discussed my concerns and things I was noticing in my skins and Chloe provided me with answers and solutions to over come them. My main concern has always been my pigment marks left from spots and wrinkles. If I can brave it i’ll be taking Chloe’s advise and going for a derma roller and peel. I rushed straight out to buy an SPF50 for my face and will no doubt be booking myself in for a little IPL to sort out my sun damage. Bet you’re still thinking but what about my skins age. So let me cure your curiosity, your age and information is entered into the computer and at the end you can look at your skins true age. For those of you who know me you’ll know I’m 28, god I know I’m on the slippery slope to 30. As for my skin its sitting happy at 23. I was so pleased especially after the shock of the sun damage. It just goes to show that looking after you skin can keep you looking younger. If you’re just curious give it a go you won’t be disappointed. 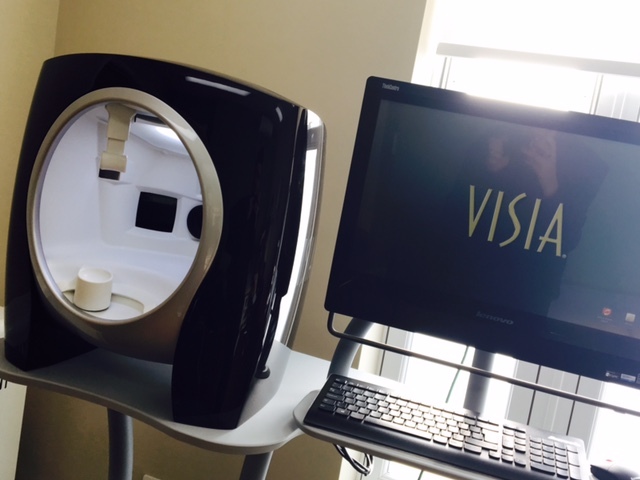 If you’re looking to make changes to your skin then definitely have a VISIA analysis. Not only does it help you see everything, and I mean everything but it’s a great comparison tool. Have one before and one after your treatments to see the difference your treatments have made. 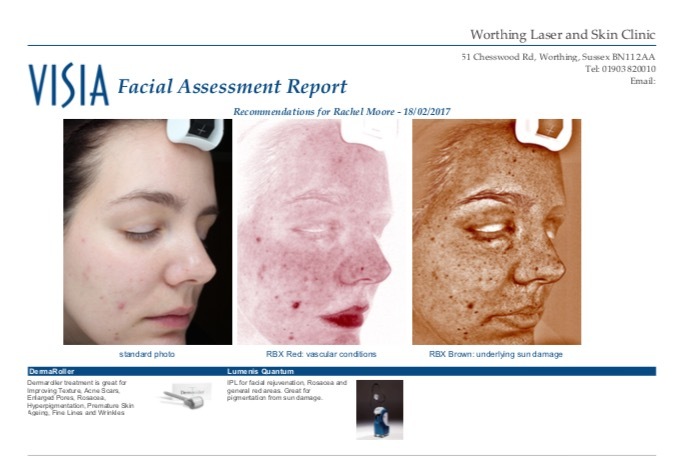 If you need a little more information click here to visit Worthing Laser and Skin Clinic’s website. 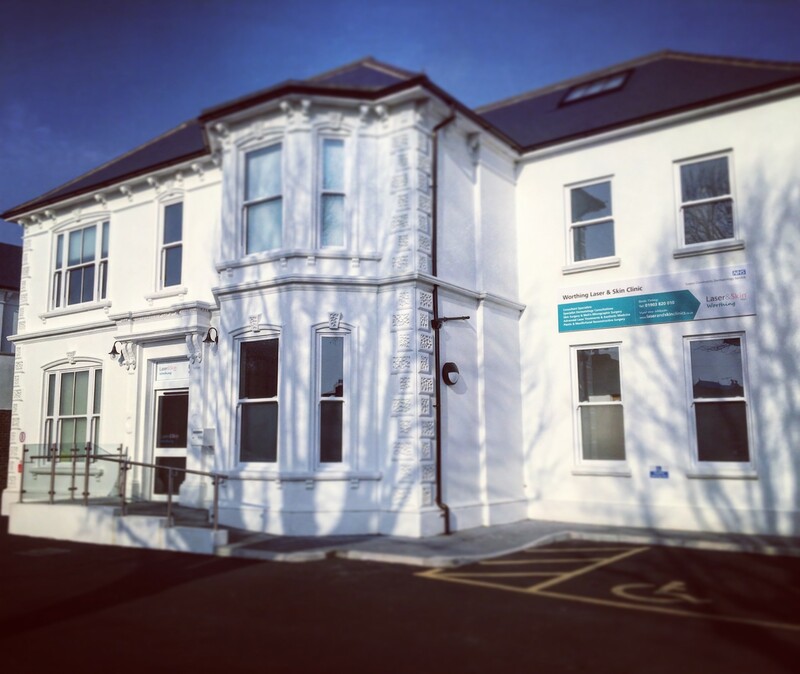 The clinic it’s self is beautiful extremely professional and equipped with the latest equipment and treatments along with highly qualified staff. If Worthing is a little far they also have clinics in Brighton and Hove.